These cookies have the delicious flavor of banana bread, and peanut butter in a portable cookie. 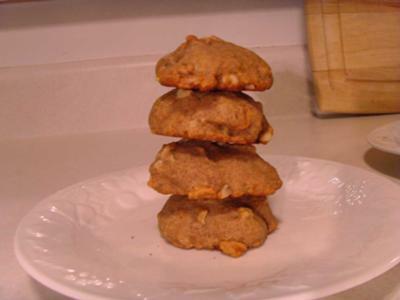 They're kid and mom friendly with the healthy addition of bananas and whole-wheat flour. My husband, and toddler love these cookies! You can also try many variations, like adding chocolate chips or peanut butter chips. 1. Starting with room temperature butter, cream together with sugar until light and fluffy. Add vanilla, and egg and continue beating on high. Add softened peanut butter and bananas. Mix until combined. 2. Sift flour, salt, baking soda, cinnamon and nutmeg together. Add to wet ingredients and stir until smooth. Fold in walnuts and coconut. Refrigerate dough 30 minutes. 3. Preheat oven to 350F (180C) degrees. Spray two cookie sheets with cooking spray, or line with a baking mat. Place by rounded teaspoons onto cookie sheet. Bake 11-12 minutes. Tastes and smells great! Good recipe.